R.J. Tilley provides exceptional residential plumbing and remodeling services in Hanover County. 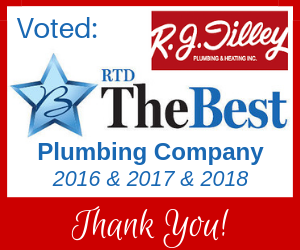 R.J. Tilley has exceeded the expectations of central Virginia homeowners with high quality plumbing services for over 40 years. During this time, our services have evolved from basic plumbing to incorporate full kitchen and bathroom remodeling. With a complete staff of trained plumbers and carpenters, our team offers the resources and skill to handle any project. Whether you need gas conversion for your new stove or want to make the switch from propane to natural gas at your outdoor grill, our team is licensed and insured to handle all your gas piping needs. If your home is surrounded by lush, mature trees, you are at risk for a root meets pipe issue underground. Gurgling sinks and recurring clogged drains are just one warning sign of something happening beneath the surface. R.J. Tilley’s experts use a number of inspection technologies to pinpoint the issue and devise an efficient, long-term solution for your sewer line repair. For over 20 years we’ve been remodeling kitchens and bathrooms so our customers can live more comfortably. We’ll take care of everything including painting, sheet rock, electrical, flooring, tile and cabinetry. If you’re interested in remodeling your kitchen or bathroom, visit our showroom for design inspiration. At R.J. Tilley, we understand that the safety and comfort of your home and family is contingent upon properly maintained systems. From emergency repairs to scheduled maintenance and equipment installations—we can fix that! We’ve earned a reputation that we’re proud of over the past 40+ year serving the Hanover, VA area. Read more of our online reviews!